The album was mastered by Christoph 'Doc' Stickel for CS Mastering/Vienna, Austria. Additional recordings were completed as follows: Simon Phillips' drums recorded by Jason Mariani at Brotherynstudios in Ojai, CA. Bodo Schopf's drums recorded by Rolf Munkes at Empire Studios, Bensheim, Germany. Graham Bonnet's and Robin McAuley's vocals recorded by Jimmy Waldo at "Where's That Track Studio" in Los Angeles, CA. Recently, the band also announced they will be welcoming back Simon Philipps and Bodo Schopf - who each played drums in MSG - to the MICHAEL SCHENKER FEST line-up. Simon who played on the MSG debut album will return as the main drummer on the upcoming second album. Due to his schedule, he is unable to be the live drummer for the upcoming US tour. This role will be completed by Bodo Schopf, who played on "Perfect Timing" and "Save Yourself". With the sudden passing of Ted Mckenna, Bodo will be featured on the upcoming record but in a smaller role as he had the important job of preparing for the US tour. 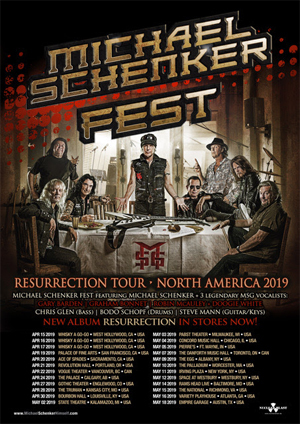 MICHAEL SCHENKER FEST will kick off their US tour on April 15th at the Whisky A GO GO. the trek will include performances in Vancouver, Chicago, and New York before concluding on May 18th in Austin, TX!